The production of some of the components has taken more than we expected. We have made further technological improvements to the machine. You can read more about that below. With all the components in place and the set of improvements finally integrated, it’s important that we test this version of the knitting machine under real-life conditions and with real users for a period of time. This will allow us to deliver a product that will last. Our entrepreneurial naivité has also played a part on this. A product of this complexity requires more work and time than our boundless optimism predicted. Because of this, we’ve made some miscalculations on the development time, with the process being much slower than predicted. For this and the reiterated delays, we want to apologize. We also want to thank you for your support and patience along this challenging but rewarding journey. The machine is taking longer than expected but it’s becoming a much better product. 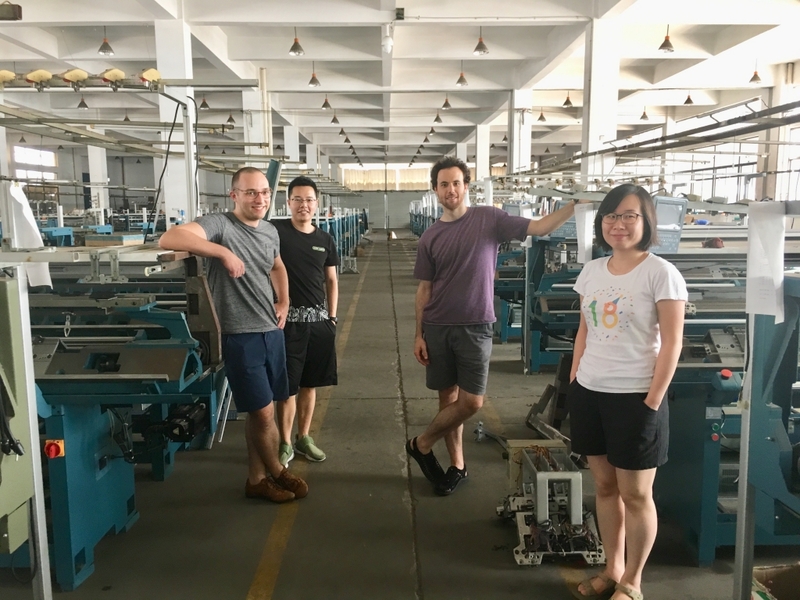 We keep working hard to get these knitting machines to you as soon as possible. We are excited that we’re getting closer to the magic moment in which we ship your machine. We have been assembling the new longer machine with the newest jig and the outcome has been great. We’ve introduced some small changes to the design of the jig to adapt it to the new length and make the overall process a bit easier. Today is the beginning of China National Day and it will last between three days and a week, depending on which supplier you ask. Our jig supplier will start manufacturing the final jig next week and it will take around 25 days. This will not be an issue since our current jig can be used to assemble machines. We have assembled a machine with the new length and it works as it used to. Its structure is holding as well as before and calibration has not been an issue. For a while, we have been thinking about changing the motor that moves the carriage and after countless hours of operation, we’ve finally decided to do it. There will now be a bigger and a better motor. The old motor was a stepper motor. Whilst being robust and good value, we couldn’t quite get the performance we needed for its long-term reliability. We are now using a bigger and much stronger industrial brushless AC servo motor. These type of motors are more technologically advanced, have a much better torque performance and are much quieter, making the machine operate more reliably and smoothly whilst generating less noise. The motors are also more expensive but we will absorb this into our costs. We’ve been running the machine for a while with the new motor and it works well. Having said that, it’s very important to further stress test the machine, given how important the change is. 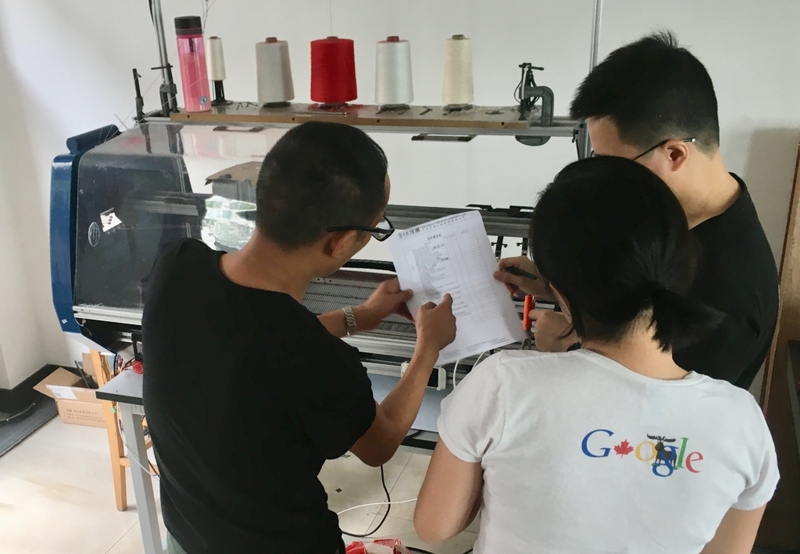 For proper validation, we want to put the knitting machine in a real setting, outside the factory, and for it to be used by others. The current machine will be traveling to London in a few days, where we hope it will get a lot of testing with real-life use cases. This is a great opportunity to get yourself acquainted with the knitting machine, so we will welcome anyone to our space and also do live online Q&A sessions for you to learn how to use Kniterate. We are giving ourselves 8 weeks of testing. If results are positive, and we expect them to be, we will commit to the sourcing and mass-manufacturing of the knitting machines. Having the first unit sent to London, to be creative and play with, is a very special moment for the team. We will provide you with more details soon about how you can visit us to see and learn how to use it! We’ve received all the pieces and, in general, they all look very good. Some small changes will be required here and there to make it all fit perfectly. We haven’t had the machine running with the casing installed but as soon as all the internal parts of the machine are in place, we will have the chance to test it and see how the product behaves. Front panel with the new length. This part comes from the largest mold we’ve ever made. The development of the remaining boards, mainboard and screen controller board, has taken a bit longer than we anticipated but they are in production right now and will be with us next week. We’ve been working on a small but very important addition to the firmware. A few weeks ago, the only way to update the firmware was by connecting it to the computer and performing a few tasks. This meant that once the machine left the factory, it would be very difficult and costly to update the firmware. As you can imagine, it’s almost impossible to get the software of a product of this complexity right on the first try. This change allows us to correct any possible bug the first machines might have and listen and incorporate your feedback along the way. We will be able to tailor Kniterate to your needs, even when the machines are far away from us. To make this possible, new firmware updates can now be uploaded into the microprocessor of the machine via SD card. The process will be as simple as saving the update file onto the SD card and introducing it to its slot. The machine will detect the file and it will perform the update automatically. The initial visit from the certification company was very positive. Minor changes and additions like warning stickers in some places and changing the on/off switch are required. Once this is done we’ll be ready for the CE certificate. This month we will be releasing the alpha version of our software for backers to test and give us feedback through our feature request system. As a machine backer, you should have access to the Machine Backer forum. If you don’t, please get in touch. Alex (left) our software developer in Boston made a visit to China for a couple of weeks in August. He took a crash course in knitting technology and we made a lot of progress on the software backend. Yang (to the left of Alex) is our mechanical engineer on the ground. We also want to celebrate that Chen (right) has been with us for a year, after leaving Canada! Thanks for believing in Kniterate Chen! We have used 34.62% of the cash we’ve received from you (from 30.18% on our last update). 65.38% of all the funds you have given to us are safely deposited.